While you can see a good overview of all the ranges we offer on our gallery page, we thought it would be useful to showcase individual ranges here on the blog so you can get a good feel of what they are and the options you can have with each one. 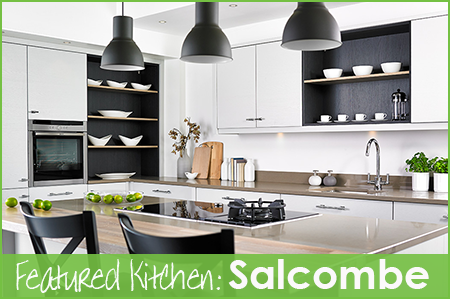 For the first of these we’re looking at the really lovely Salcombe kitchen. The Salcombe kitchen is a relatively new range from Daval which combines elements from both modern and traditional kitchen styles to create a very contemporary look. It is a painted kitchen, which is usually associated with the shaker style, and yet it has smooth, minimal lines of a modern kitchen. You can go further down the modern route with handless doors or soften with a simple bar handle, as shown below. Being a painted kitchen, it is available in a number of colours which allows you the option to create something quite soft and vintage looking, using colours such as Alabaster Nature or Dove Grey Nature, or something really dramatic such as the dark and brooding Charcoal Nature. Because they are all produced bespoke for you, you can even combine different colours to create a unique look. Who would choose the Salcombe kitchen? This kitchen would suit anyone looking towards the more modern end of the scale without necessarily wanting the ultra-minimal gloss look. The range of colours supports choice and this versatility lends itself to most styles of home. This kitchen could certainly work well as a family kitchen and great storage options mean it can be functional in small spaces as well as larger ones. To see how a Salcombe kitchen could look in your home, book us in for a design consultation. 0 Responses to "Featured Kitchen: Salcombe"